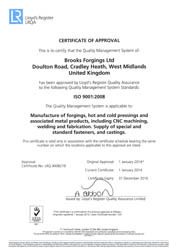 Transportation Industry - Metal Components - Linkup Registered - ©2019 Brooks Forgings Ltd.
We work from a wide variety of manufacturing disciplines and materials to provide bespoke solutions to a diverse range of industries. Rail, Air, Sea, on or off highway... all of these transportation sectors use a diverse range of components that can be manufactured by Brooks Forgings here in the UK. 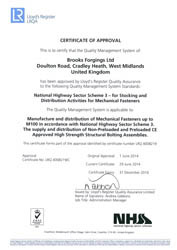 We operate to Lloyds ISO 9001 and are also CE and National Highway Sector Scheme (NHSS) approved. 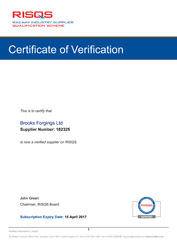 Brooks Forgings Ltd are fully registered as a supplier on the Achilles Link-Up / RISQS Database for suppliers to the Rail Industry for the provision of products and services as detailed in our membership listing on www.link-up.co.uk. 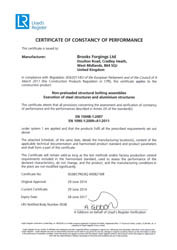 A copy of our certificate can be found below. We pride ourselves in our ‘can do’ approach to projects, often making parts that others have turned down. Nevertheless we are not exclusively a company that makes small volume specials, we are also at home reacting to the demands of modern automotive production lines to. Our engineers are frequently involved at the prototype stage ensuring that components are designed in a cost effective way for manufacture. Continuing to monitor pre-production and production batches to ensure our customers are satisfied. Please contact us today to discuss the manufacture of components for your next project.